“You’ll all be able to go home soon. 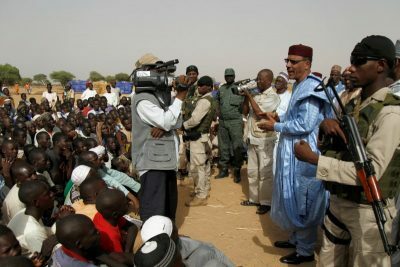 Boko Haram is nearly finished,” Niger’s Interior Minister Mohamed Bazoum told a crowd of refugees seated quietly on dusty, sun-baked flats. His words of optimism were belied by the dozens-strong security detail required to protect him as he toured his country’s southern border. Seven years into an insurgency that spread from Nigeria into Chad, Niger and Cameroon, regional armies are now in a final push to defeat Boko Haram, a once obscure Islamist sect turned deadly militant group. But lingering divisions in the countries’ multi-national joint task force (MNJTF) are complicating that mission. “If there’s no strategy to attack Boko Haram together, we won’t ever finish with them,” Mahamadou Liman Ali, an opposition lawmaker from southern Niger, told Reuters in Niamey. At a time when the world’s wealthy nations are focused on the fight against Islamic State and al Qaeda, financial support for the MNJTF’s efforts against Boko Haram, which has pledged its allegiance to IS, have fallen short of targets. That has left the task force’s members – including Chad, the region’s capable but increasingly reluctant military powerhouse – to shoulder the bulk of the costs of fighting the group. Boko Haram’s victims, which include 2.4 million displaced, live in hope that this month-old offensive – dubbed Operation Gama Aiki, or “finish the job” in the local Hausa language – might succeed where others have failed. Some have doubts. From where he stays in southern Niger, refugee Usman Kanimbu sees smoke rising from the coalition’s air strikes on insurgent positions in Nigeria, the home he fled. As the sun sets over the Nigerian border, a featureless expanse of sand and scrub trees, soldiers from Niger peered over an earthen bern at territory held by Boko Haram. The skies above the borderlands now rumble daily with the sound of fighter jets. Chadian troops have ventured onto Lake Chad, a Boko Haram stronghold. Regional military officers say they are taking back ground from the insurgents. The task force may indeed be making headway against Boko Haram, which has fewer footholds than it once did. Its leader, Abubakar Shekau, may even be dead. But the MNJTF is a far cry from what it was conceived to be, a dedicated 8,700-strong force blending soldiers from Nigeria, Niger, Cameroon, Chad and Benin. Instead, the nations rely on their own armies to deal with Boko Haram threats. Troops from Chad, which has the region’s strongest military, reinforce when needed then head back home. “Each force is based in its country of origin. There’s no integrated force with battalions moving in perfect coordination,” said Vincent Foucher, West Africa researcher at International Crisis Group (ICG). The need for operational integration in the fight against an enemy that knows no borders was exposed during a similar regional offensive early last year. After troops from Chad and Niger drove Boko Haram from a string of towns in Nigeria’s far north, they waited in vain for the Nigerian army to arrive and hold them. “We were there for three or four months, but the Nigerian troops that were meant to take over from us were not ready,” Niger’s Brigadier General Abdou Sidikou Issa told Reuters. Niger and Chad withdrew, according to a source with knowledge of the operation, because they feared becoming an occupying force. Issa said the troops were overstretched logistically, however. Either way, the vacuum they left allowed Boko Haram to reclaim positions and carry on cross-border raids. “That’s what’s created problems for us again today,” Issa said. The MNJTF was meant to prevent a repeat of those kinds of incidents. The African Union endorsed the force in January 2015 and a headquarters was established in Chad’s capital N’Djamena to coordinate forces against the ever-evolving threat of Boko Haram. The AU has struggled to rally contributors to foot the bill for the MNJTF’s $700 million budget, however. Donors, led by Nigeria and France, pledged $250 million in February, just over a third of what was needed, but dispersal has been slow. The United States has also aided with intelligence and training. A senior MNJTF officer, who asked not to be named as he was not authorised to speak, told Reuters the money received so far was so little that it only had covered the cost of 11 vehicles and some radio equipment, with the individual armies bearing the rest of the costs. “There are all these declarations of intentions, but, in concrete terms, nothing has been done yet,” he said. A spokesman for the MNJTF did not respond to a request for comment. A Boko Haram attack last month on Bosso, in southeastern Niger, which killed 32 soldiers and a number of civilians, was the kind of incident the MNJTF was created for. But rather than the multinational force kicking into action as it is supposed to, Niger’s President Mahamadou Issoufou had to fly to N’Djamena to lobby neighbour Chad for help. Having played a lead role along with France in a 2013 intervention in Mali to drive back jihadist groups there, Chad’s President Idriss Deby has become indispensable in the fight against West African Islamists. But with low oil prices now causing Deby economic headaches at home and little direct financial support coming from his allies, analysts say he has grown resentful. Two weeks after President Issoufou’s visit, Reuters visited a half-finished hotel complex in the southern Niger city of Diffa that had been fully booked out by the Chadian army. The Chadians were nowhere to be seen. Dozens of bungalows sat empty. It would take more than a month for them to arrive. Excluding its oil sector, after 7 percent growth in 2014, Chad’s economy contracted by 1.5 percent last year, according to the International Monetary Fund. Oil output rose to record levels, but low prices meant revenues dipped. “This is costing (Deby) a lot of money. There’s a big budget crisis … He’s definitely hurting,” said Nathaniel Powell, a researcher with the Swiss-based Fondation Pierre du Bois. A Chadian government official did not respond to a request for comment. 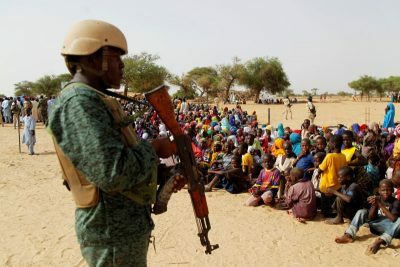 Niger’s tiny army – 15,000 troops to cover 1.2 million square kilometres (463,300 square miles) of territory – is overstretched by Boko Haram, but also by the overflow of unrelated Islamist violence from Mali to its west. Cameroon has meanwhile deployed thousands of troops, including special forces, to its north to secure its own territory against a suicide bombing campaign. And while Nigeria’s President Muhammadu Buhari has shown more willingness than his predecessor to take on the insurgents, decades of graft have hollowed out his military and it now faces resurgent militancy in the oil-producing Niger Delta. The senior MNJTF officer said the regional neighbours would continue to improve the force. In the meantime, they had no other choice than to act. “If we wait, Boko Haram isn’t going to wait for us, are they?” he said.